Monaghan manager Malachy O'Rourke speaks to his players. A number of decisions made by referee Anthony Nolan in today's All-Ireland SFC left Monaghan manager Malachy O'Rourke scratching his head. 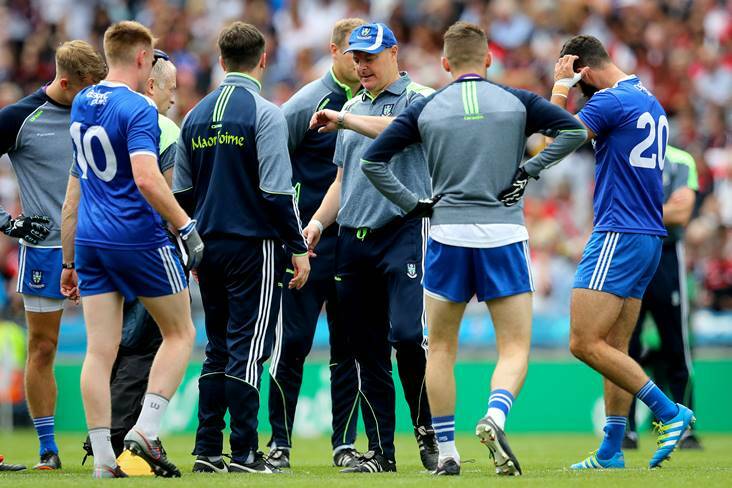 In his post-match interview with RTE's The Sunday Game, O'Rourke put the Wicklow official's performance under the microscope. "I thought the free count was against us, I thought we were working very, very hard for frees," O'Rourke opined. "I can't understand how at the end, it's the first match all year that I have been involved in that we got three minutes. "I thought even the last one with Kieran (Hughes), I thought the referee had his hand up for a free in and didn't give it so there are a lot of things. "Look it, I haven't had the advantage of looking back but there's a number of things that we would be very disappointed about but, overall, we can do nothing about it now. "We're just bitterly disappointed we came out on the wrong side of it." The allocation of just three-minutes of stoppage time at the end particularly irked O'Rourke. "All year, in the games we've played, we've had seven minutes additional time, eight minutes additional time. I thought every sub that went onto the field was 20 or 30 seconds. "I know Petey Harte was down for an injury before that. I can't understand. I stand to be corrected if I'm wrong but I can't understand how there was only three minutes. "All year we've had six, seven, eight minutes especially with time wasting and things like that." He added: "I'm not taking anything away from Tyrone. Tyrone won it, they deserved it on the day but, look it, bitterly disappointed with the way a couple of things went."